Automobile accidents involving pedestrians are often more complicated than those involving two vehicles. In part, this is a result of North Carolina’s unforgiving contributory negligence rule. This outdated legal principle holds that a defendant can completely avoid liability if he or she can prove the plaintiff was even 1% at-fault for the accident. In pedestrian or bicycle cases, the insurance companies frequently try to argue the plaintiff was doing something unlawful at the time he or she was struck by their insured. 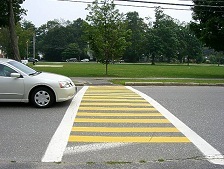 For a crosswalk cases, the answer is simple – look at the statutes. North Carolina law is clear; a motorist has an obligation to stop at crosswalks for pedestrians. If you have suffered a personal injury as a result of being struck by an automobile while walking or riding your bicycle, contact the Raleigh pedestrian injury attorneys of Maginnis Law at 919.480.8526. North Carolina has two very important statutes for pedestrians at crosswalks: N.C.G.S. § 20-172 and N.C.G.S. § 20-173. N.C.G.S. § 20-172 pertains to the obligations of a pedestrian when there are special pedestrian-control signals in place. In that situation, “[p]edestrians facing such signal may proceed across the highway in the direction of the signal and shall be given the right‑of‑way by the drivers of all vehicles.” If a vehicle strikes a pedestrian while they are lawfully making their way across a crosswalk with this signal, there is unlikely to be any contributory negligence defense. The pedestrian should be compensated for his or her injuries. If the insurance company tells you otherwise, you should strongly consider calling an attorney. Another section of N.C.G.S.§ 20-172 states that the pedestrian is, of course, not to cross the street if the “Don’t Walk” sign is flashing. If a pedestrian is injured while crossing with the “Don’t Walk” sign flashing, proving liability and defeating contributory negligence is much more difficult. It is not impossible, however. North Carolina’s “last clear chance” exception to contributory negligence could save your case. The second relevant statute is N.C.G.S. § 20-173, and it pertains to the obligations of automobile drivers at intersections without pedestrian-control signals. It provides simply that “[w]here traffic‑control signals are not in place or in operation the driver of a vehicle shall yield the right‑of‑way, slowing down or stopping if need be to so yield, to a pedestrian crossing the roadway within any marked crosswalk or within any unmarked crosswalk at or near an intersection.” If you are struck while lawfully walking or riding your bicycle through a crosswalk, and have sustained injury, you likely have a valid negligence claim. The automobile driver has a statutory obligation to look out for your safety. To speak with the Raleigh pedestrian accident attorneys of Maginnis Law, call 919.480.8526 or email us using our contact page. We regularly represent clients in and around the Triangle area, including Raleigh, Durham, Chapel Hill, Cary, Apex, and Morrisville, and we do not charge for consultations. We are happy to discuss your case over the phone or in person. We also handle all personal injury cases on a contingency basis.